Five rounds per target, four targets per page. Twenty rounds in total. There are four classes, but if you have something interesting to shoot that doesn’t quite fit these classes, go ahead and enter anyway..
CLASS ONE: Any rimfire handgun with iron sights. CLASS TWO: Any rimfire handgun with optic sights. CLASS THREE: Any centerfire handgun with iron sights. CLASS FOUR: Any centerfire handgun with optic sights. DISTANCE : 25 feet. Note the actual distance on your target if 25 feet is not available at your range. SHOOTING POSITION: Standing, un-supported, off-hand, one or two hand grips are permitted. SCORING: In each class you are allowed 5 shots at each of four targets, twenty shots in all. The circles are valued as numbered. Touching a line counts as a hit. 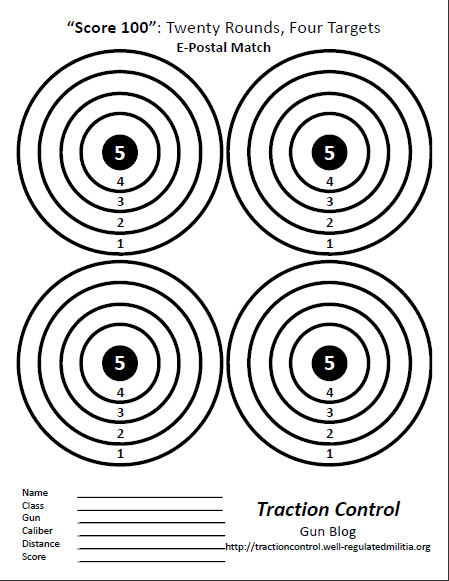 Mark your score on each target, along with the class and type of gun used. Only write the name you want to appear in the results, as that name or your target may get posted. STRATEGY: Shoot 5 shots into each of the four 5’s and Score 100! MULTIPLE ENTRIES: Enter more than once. But you can only enter once for any given gun, in a Class. Shoot the target as many times as you like and send in your best one. All rules are subject to revision if needed. All entries must be received by Midnight on Monday, October 31st. Results will be posted soon after.